Be the first to share your favorite memory, photo or story of May. This memorial page is dedicated for family, friends and future generations to celebrate the life of their loved one. May Senteney, age 97 passed away March 29, 2019 at her residence at Brookstone Estates, Mattoon, IL. Visitation will be Monday, April 1, 2019 from 9:30 am to 11:00 am at the First Baptist Church, 1804 South 9th Street, Mattoon, IL. Funeral service will follow at the church at 11:00 am, with Reverend Dennis Strawn officiating. Burial will follow at Dodge Grove Cemetery with Reverend Robert Clark officiating. Schilling Funeral Home is assisting the family. 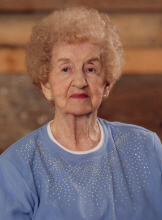 Mae was born May Newlin on a farm east of Westfield, IL on December 2, 1921 to Riley and Zona (Lee) Newlin. She was raised on the family farm located on the Westfield – Clarksville Road approximately 4 miles east of Westfield. She attended and graduated from Richwood School that was a one room school with grades 1 through 8. She attended and graduated from Westfield High School in 1940. She was active in many school activities to include basketball which she excelled at. While attending high school she lived during the school week in a boarding house across the street from the high school with other high school girls. She never forgot her roots and supported anything involving Westfied. After graduating from high school, she met Raymond E. Senteney at the Charleston Skating Rink. They were married February 7, 1942 at the First Baptist Church parsonage in Mattoon with Reverend James Lively officiating. She worked at the Dinner Bell Restaurant, Hayes Freight Lines, Stiff’s 9th Street Market and Mattoon Community Unit 2 School District in the Dining Services Unit. She initially served lunches to the students attending the two one room schools in Pine Acres where first and second grades were taught. She then thru the years worked in the lunch rooms at Central Junior High, Jefferson Junior High, Columbia Elementary School and Mattoon High School from where she retired in 1986. She continued to be active with management of the family farm located east of Westfield until the time of her death. She was activity with the PTA at Lincoln School, Bennett School, Central Junior High and Mattoon High School. She was an active mother with the Cub Scout Pack 33 at the First Baptist Church and Boy Scout Troop 57 at the First Methodist Church. She was a supportive mother and active with DeMolay Mothers Association. She was a member and former member of the Mattoon Police Department Wives Association, Mattoon Women of the Moose, Moose Couples Square Dance Club, Mattoon Motorcycle Club and Clark County Farm Bureau. She had been a member of the Mattoon First Baptist Church since 1942 and was the third senior member of the church. She had served as a deaconess and was the last surviving member of the building committee for when the current church building was built. She was a member of the Couples Sunday School Class and Joy Givers. For many years she was a member of many corner’s juries. She had served as an election judge and also drove voters to the polls for the Republican Party. From the late 1940’s till 1956 she lived in the former Mattoon Veterans Court where 36 families of veterans lived. Each unit had to have a veteran and children. While Raymond served as Mattoon Chief of Police and Mattoon Plumbing Inspector, she attended many city functions and community organizations meetings and dinners with him with them representing the city. She loved to play BINGO at the Mattoon Moose, Mattoon American Legion and Mattoon VFW for many years. She bowled for many years with the Ladies League at Etog Bowling Alley and Mattoon Bowling Alley. She played golf in the Ladies League at Rogala Golf Course until her macular degeneration no longer allowed her to play. She was an avid University of Illinois basketball fan. She and Raymond were the proud parents of son, Steven Ray born in 1945. They were honored when he was selected for an appointment as a Special Agent with the Federal Bureau of Investigation (FBI) and which he was affiliated for 43 years. Raymond died November 22, 2013. She was also predeceased by her parents and siblings Wayne Newlin, Audrey Newlin, Lee (Bill) Newlin, Harold (Dutch) Newlin, Mary Newlin, Castle Newlin, Wilma Newlin, Dorothy Johnson, Vita Newlin, Nita Newlin, & Cora Boyle. She is survived by her son Steve (Diane), Mattoon, grandchildren Kimberly Mae (Keith) Senteney Grant, Germantown, TN and Steven Ray (Kirsten) Senteney, II, Beaverton, OR. She is also survived by 5 great grandchildren, Conner Grant, Brooke Grant and Juricas White, Germantown, TN and Mina Mae Senteney and Maisie Senteney, Beaverton, OR. She leaves a special niece, Kathy Boyle (Steve) Roling, Louisville, KY. She leaves a special friend, Dee Liffick of Oakland, IL who she attended high school with. She is survived by 9 additional nieces and nephews. Additionally, surviving is Norman Nolte, Mattoon, brother-in-law. The family suggests donations and memorials to the Mattoon First Baptist Church, Shriner’s Children Hospital, St. Louis, MO and St. Jude’s Children’s Research Hospital, Memphis, TN. A special thanks for her caregivers over the past several weeks, Sarah Bush Lincoln Family Practice, Lincoln Land Visiting Nurses, Lincoln Land Hospice Program, Sarah Bush Lincoln Hospital and Mattoon Rehabilitation and Health Care Center. She appreciated her many friends and neighbors at Brookstone Estates South where she had lived the past 5 years. To send flowers or a remembrance gift to the family of May Senteney, please visit our Tribute Store. "Email Address" would like to share the life celebration of May Senteney. Click on the "link" to go to share a favorite memory or leave a condolence message for the family.